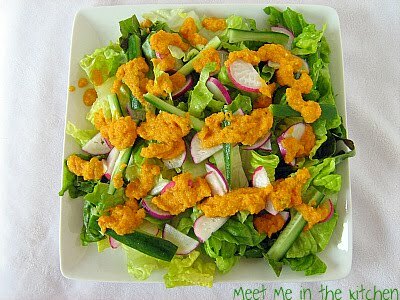 I found this recipe when I was searching for a nice side dish or salad to take to a family reunion potluck lunch. 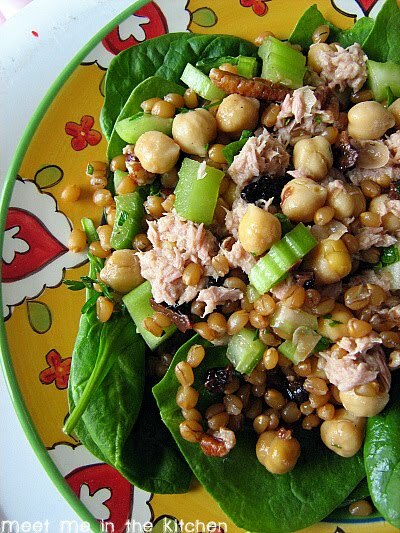 I loved that this salad used barley as the base. It was quick to make and easy to transport. 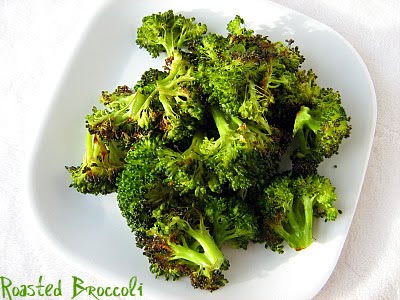 A great side dish. 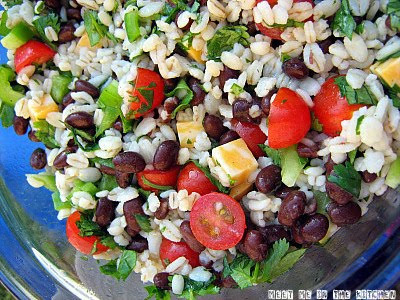 I thought the barley went really well with the black beans, as well as the other flavors that were going on in the salad. This salad tasted great chilled, but it would also be really good when served at room temperature. 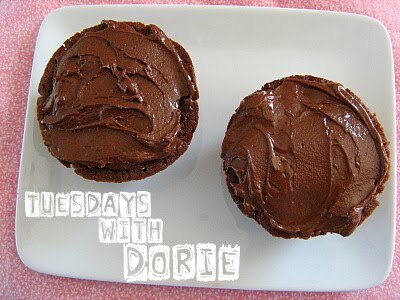 This Tuesdays with Dorie recipe was chosen by Wendy of Pink Stripes. You can find the recipe on her blog, along with lots of other delicious recipes. I have made multiple recipes from Wendy's blog and love it. I made these when I was taking dinner to someone who had just had a baby. I completely omitted the rum from the cake and the syrup. I added 1/2 tsp of lemon extract to the syrup and the cakes. 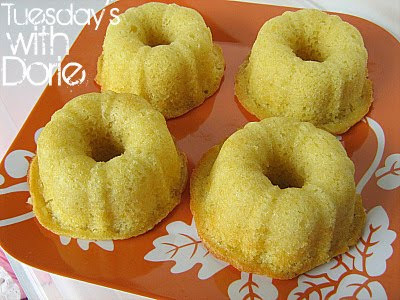 I made 1/2 of the recipe, which made 6 mini bundts, and they were done baking in about 19 minutes. I got to taste a crumb of this cake because my kids got to the mini bundt I left for us to try before I could get a real bite. I loved how easy it was to make. Definitely one that you could throw together at the last minute. Check out who else loved this recipe by visiting the TWD Bakers! I saw a recipe recently for black bean and avocado burritos and decided I would give avocados another try. Lindsey's new blog, Fresh Clean Start, also gave me a push to try them again. Unfortunately, I got food poisoning a few years ago and avocados were involved, so that sight of them for many years made me feel sick to my stomach. I decided it was time to get over that and I am proud to say that I now like avocados again. I decided to change this recipe a little bit and make it healthier, by removing the tortilla and cheese, so essentially just using the refried black beans and slaw that were in the recipe. 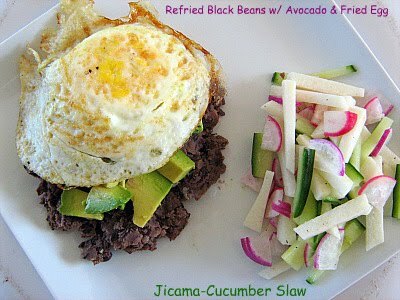 I also added a fried egg because avocado and egg are a good combination, in my book. I really liked the way my version of this recipe turned out. I added a little bit of water to the black beans, when reheating the leftovers and it made them a little bit creamier. I also added radish to the slaw. 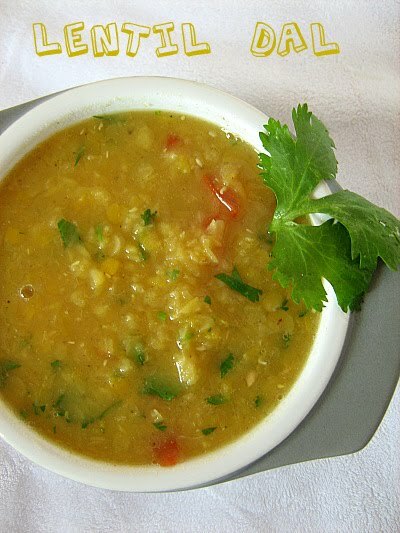 Red lentils are one of my favorite foods. I love all lentils, but red ones are my favorite. I made this one night when we needed a quick dinner. It is very similar to other lentil dishes I have made in the past and it was really delicious. This is a quick and easy way to prepare lentils. I get my red lentils at EarthFare in the bulk section, but also saw them in Publix the other day. Buying them in bulk is much more affordable for me. If there was ever a salad dressing that would make you want to eat salad at every meal, every day for the rest of your life- this is it. I saw this recipe on Prudence Pennywise a couple of weeks ago and Prudy served it with an Asian Steak Salad. I don't eat steak, but I had a feeling that this salad dressing would be good on any type of greens and veggies. I didn't really measure out the ingredients- except for the carrots and celery. I just estimated the amounts (I feel fairly confident doing this, given how much time I spend in the kitchen) and gave them a whirl in the blender. I tasted it with a spoon and then I tasted it again. This stuff was so good, I probably could have eaten it as soup or poured it in a glass and had it as a drink. But really, it is so yummy. 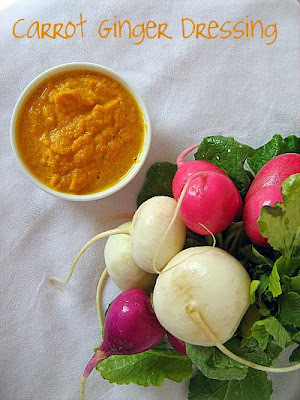 Nice and fresh, but also creamy from the pureed veggies. It would be great as a dip for vegetables too. Luckily, I doubled the recipe, so after we ate it one night, I was able to enjoy it for lunch over and over again. Salad never tasted so good. I wasn't going to make this week's TWD. When I looked up the recipe for Dressy Chocolate Loafcake, it just didn't appeal to me. But, then my hubby asked me to make something for a birthday. I needed something fast. I needed something easy. I looked at the recipe again, decided to cut it in 1/2 and turn it into jumbo cupcakes (a 1/2 recipe made 5 jumbo cupcakes). I subbed low-fat buttermilk for the sour cream in the cake and these guys were ready in 28 minutes. I had leftover fondue ( details below) in the fridge, which turned out to be surprisingly spreadable and a great frosting. We kept 1 jumbo cupcake at home to share and cut it into 6 pieces. I had 1/2 of one of those 6 pieces and it was really good. Go check out Amy Ruth Bakes for the real cake and the recipe. Ok, this is the worst picture in history, but sometimes when you have kids- pictures of food are way less important than the fun that is happening at the moment. I was watching one of my best friends kids' the other day and I decided fondue would be a fun dessert. 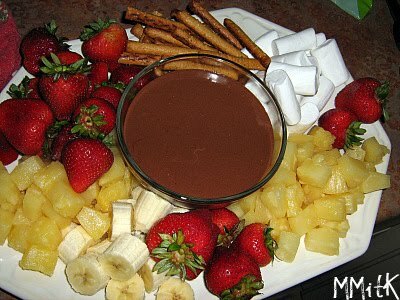 I found a recipe on myrecipes.com that included marshmallow creme in the fondue. I thought that would make the flavor more fun for kids, so that is the recipe I used. We dipped strawberries, pineapple chunks, bananas, pretzels, and marshmallows. The leftover fondue also makes a great frosting. The marshmallow creme thickens up the fondue when it refrigerates and makes it incredibly spreadable. Who knew? Recently, I took someone dinner and dessert. 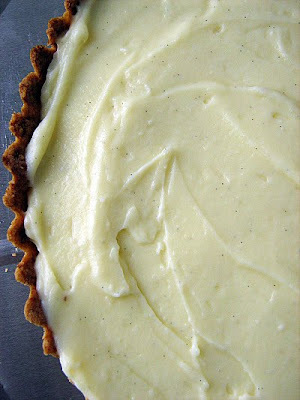 Unbaked frozen tart dough sure comes in handy. Last time I made mini tarts, I actually made the full amount of tart dough (Here is a great tutorial on making the tart dough) and pressed the dough that I didn't use into my large tart pan and put it into the freezer. When I needed it, all I had to do was pop it in the oven and bake it. Since there are so many fruits that are in season right now, I decided that I would make a basic pastry cream and top the tart with fruit. I remembered that Bridget mentioned Tartine's recipe for pastry cream, which uses whole eggs instead of just egg yolks and I wanted to try it. I found the recipe here and gave it a try. This pastry cream was so silky and smooth. Using whole eggs in the pastry cream lightened up the texture. It was still thick, but just lighter than pastry creams made with only egg yolks. Plus, I didn't have to add to the 13 egg whites I already have in the freezer. 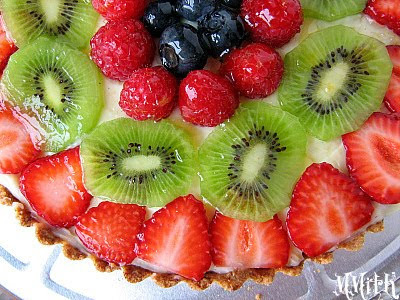 I decorated the tart with kiwis, strawberries, raspberries and blueberries. I glazed it with this peach spreadable fruit, which I warmed for a few seconds in the microwave with a splash of water. In a large mixing bowl, whisk the sugar, cornstarch and eggs until smooth. Slowly add 1/2 of the milk mixture into the egg and whisk constantly to temper them. Add the remaining milk and return the whole thing to the saucepan. Cook until you get a thick consistency, whisking non-stop. Remove from heat and pour into a bowl, let cool for 10 minutes and then incorporate the butter, one tablespoon at a time, until smooth . Cover the surface with plastic wrap, directly touching the cream, let cool completely in the refrigerator. One of my favorite things about summer, besides the sun, swimming, no school, okay nevermind- I basically love everything about summer! Anyway, one of my favorite things about summer is all of the fresh fruit and frozen fruit concoctions that you can make as a refreshing treat after being outside in the heat. These types of treats are our favorite summer desserts. This is basically the same recipe as the Fresh Mango sauce that I made a couple of months ago to top my brother's b-day cake, but this time the mango puree is frozen. I actually forgot to stir my mango mixture every 1/2 hour and it still turned out great. A perfect sweet treat for a hot day. Puree mango chunks in a blender or food processor until very smooth. Add lime juice and sugar. Pulse to combine. Pour into a shallow flat baking dish or pan that will fit easily in your freezer. Freeze until frozen through, about 2 hours, stirring every 1/2 hour to break up the ice crystals. Scrape with a fork and serve. 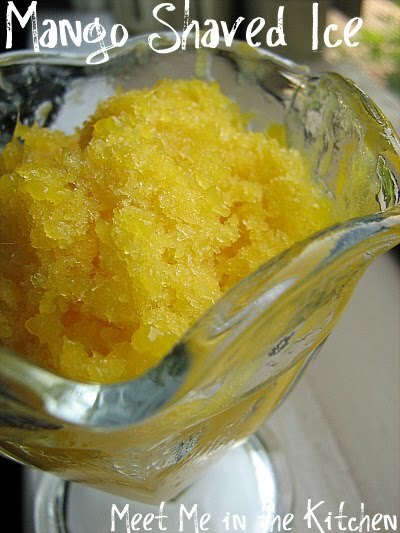 * She suggests that you can make shaved ice with any pureed fruit you want. Aim for 2 1/2 cups of liquid fruit puree. I was looking for another way to use swiss chard a couple weeks ago and somehow found this recipe for Chard Quiche. 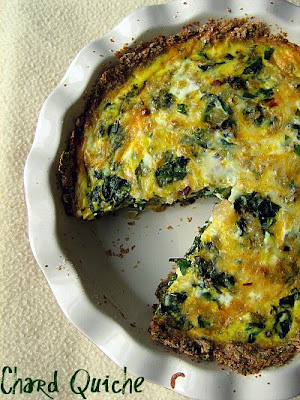 The thing that interested me the most, was the fact that the crust is made of wheat germ, flour, and sauteed chard. That's it. No butter, no shortening, etc. This made me happy because my least favorite part of traditional quiches, is the pie-type crust. That is why we usually opt for frittatas for dinner when eggs are making an appearance. I also had exactly 1 cup of whole milk in my fridge leftover from some dessert that needed to be used. I might have used more chard than the recipe called for. I didn't weigh it or measure it. I figure it is okay to err on the side of more vegetables. I also just used whatever cheese I had in the fridge. Happened to be mozzarella. This was a really good quiche. I really loved the hearty/healthier crust. The leftovers were good too. 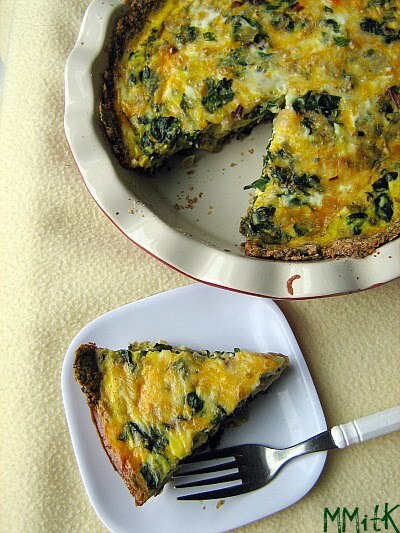 This would be a great one to serve at brunch or dinner. This is what I made the night my son told me I should open a restaurant. This sandwich is the reason my son thinks I am amazing. Well, one of the reasons. 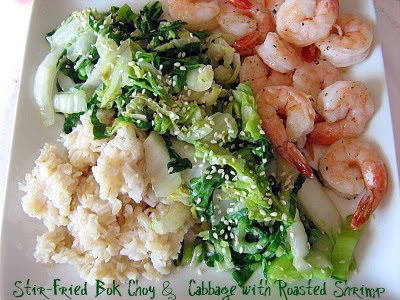 I saw this recipe in Everyday with Rachael Ray and thought it would be a good dinner. 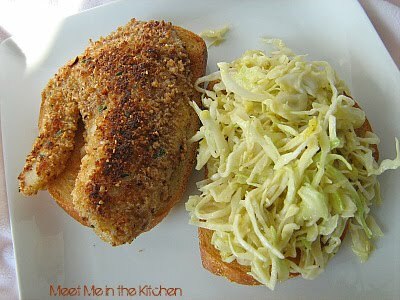 The kids love fish and I want to like slaw. The fact the the slaw here uses dijon mustard, dill pickle relish, a little honey & oil, (none of that gross white stuff), made me very hopeful. I decided to follow the recipe as closely as I could. (Of course, I had to get rid of some of the fat, like the butter which I reduced almost to nothing to cook the fish in). I bought some freshly baked Italian sandwich bread from a local bakery and got to work. 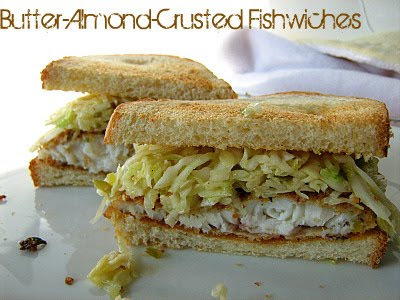 I used fresh breadcrumbs, which I made with whole wheat bread, in the breading. The combination of flavors was really great. The fresh thyme stood out. The almonds in the breading were really delicious. My kids and hubby raved about this. I really like it too. I don't really know what else to say about it besides it was absolutely fantastic. Definite repeat. I bought some wheat berries a couple of weeks ago because I wanted to try this recipe that was in Ellie Krieger's So Easy. I took this salad to a family dinner and was really hoping that there would be leftovers for me to eat the rest of the week for lunch. Everyone tried it and most people liked it. Wheat berries are really chewy, so you definitely get a chewing workout. They also require quite a bit of cooking time, but I read the recipe thoroughly in advance so I knew how much time they would need. Once again, I wasn't sure how the dried cherries would work with everything else, but they added just the right amount of sweetness and tartness with each bite. I used canned tuna instead of chicken to top the salad and modified the lemon-cumin dressing to work with the tuna. I really love having this type of salad for lunch during the week. Filling, nutritious and so good. Are you convinced that roasting vegetables is the best way to prepare them? I definitely am. Roasting vegetables is one of my favorite things. It makes the plain and ordinary veggies really shine. Like broccoli. Check out this post over at Aggie's Kitchen for more convincing (if needed) and a basic recipe. This is the other treat we made when we took our neighbor some goodies a couple weeks ago. I don't really care for brownies and neither does my hubby, so I don't ever make them. My son on the other hand, loves brownies. He saw the picture for these in the book and begged me to make them. These definitely turned out to be cakey instead of fudgy. 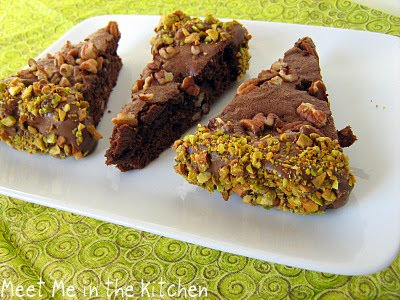 I sent the remainder of the brownies to work with my hubby and the dipped pistachio combination was a real crowd pleaser. 1. Preheat oven to 325 degrees. Line the bottom of a 9-inch baking pan with waxed paper (I used foil); Grease waxed paper and sides of pan. set aside. 2. In a small saucepan heat and stir butter and unsweetened chocolate over low heat until smooth. Remove from heat; let cool. 3. In a large mixing bowl beat eggs 1 minute or until frothy. Add sugar and vanilla; beat 2 minutes or until thickened. Beat in melted chocolate mixture. Stir in flour. ( I added half the pecans to the batter and stirred them in at this point). Spread evenly into the prepared pan. Sprinkle with toasted pecans; press lightly into batter. 4. Bake about 25 minutes. Cool in pan on a wire rack. Remove brownie from pan. Remove waxed paper. 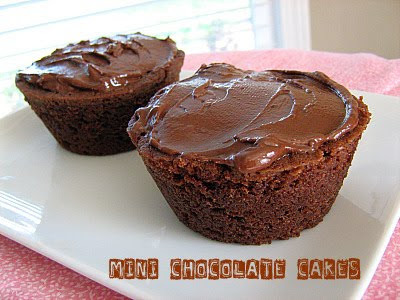 Cut brownie into quarters; cut each quarter into 4 wedges. 5. 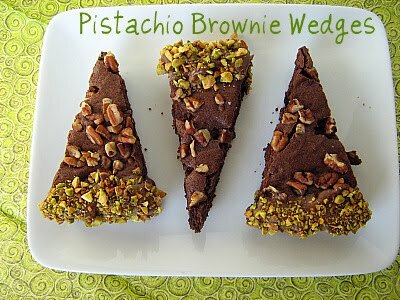 Carefully dip outer edges of brownie wedges into melted dipping chocolate and then into pistachios. Place on waxed paper and let stand until set. On one of our recent trips to the Farmer's Market, we were able to get some beautiful swiss chard, kale, red leaf lettuce, and bok choy. All from the same farmer. He was so grateful for our business or maybe just thought my girls were so cute, that he threw in another bunch of bok choy, free of charge. I decided a simple stir fry was in order and found the perfect recipe. I had also been wanting to try Ina's method of roasting shrimp in the oven and it turned out to be a perfect meal. I added some brown rice to round out the meal. My kids loved this shrimp. The stir fry was mild enough for them too, so this was a really kid friendly dinner. 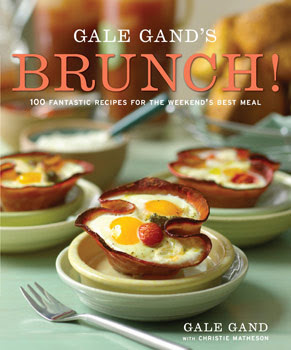 Have you seen this book, Brunch by Gale Gand? Well, it is a really good one, full of delicious pictures and great recipes. It has been sitting on my book shelf for quite a while and I decided it was time to give some of the recipes a try. The other day we had Backwards Day at our house. We ate brownies for breakfast, read our bedtime story after that, went to the library in our pajamas, etc. and we finished off the day by eating brunch instead of dinner. I chose 4 recipes from this book for our menu- Pineapple-Blueberry Smoothie, Roasted Pears & Rhubarb w/ orange, Bacon Waffles, and a variation of the cover recipe- Egg Cups. I don't like cooking with bacon and usually don't, but my kids love it when they get the chance to have some and I figured this was a fun way to use it. The batter was light and airy, which made delicious waffles. The smoothie was one of the best I have ever had. I don't know if it was simply because we had been out in the hot sun for hours and I was overly thirsty or just the wonderful combination (I am leaning towards this explanation) but it was great. 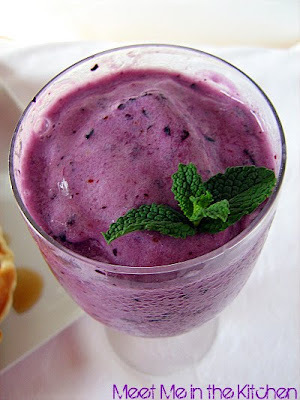 The frozen pineapple and mint just added a delicious zing to the smoothie. My girls always like having their smoothies in "fancy" cups. The egg cups were delicious. I didn't really use her recipe, but it was the same idea. I added some spinach to get some sort of vegetable in there. The roasted fruit was really good. 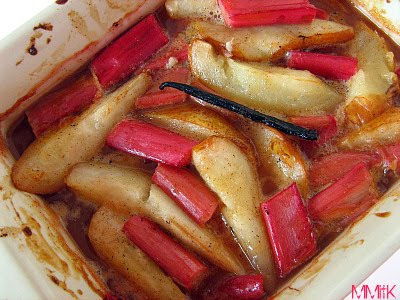 I liked the rhubarb part better because the sweet roasting liquid really went well with the tartness of it. The pears were a little too sweet. I would reduce the sugar in that one next time. The roasted fruit would be a great topping for vanilla ice cream or filling for a crumble/cobbler. Overall, this was a really fun brunch, even if it was for dinner and we loved it. In a medium bowl, stir together flour and next 3 ingredients. In another bowl, whisk together the eggs and next 3 ingredients. Stir crumbled bacon into the wet ingredients. Mix the dry ingredients into the wet ingredients all at once, just until combined. Don't overmix- it should be lumpy. 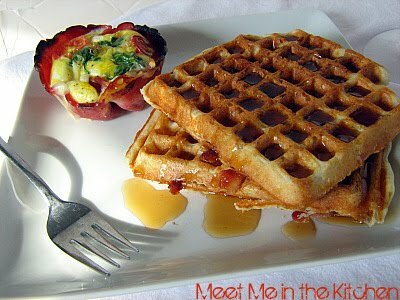 Make waffles according to manufacturer's directions; serve with maple syrup. I kinda did my own thing here. I combined 3 eggs, 4 egg whites and 1/3 -1/2 cup skim milk in a bowl, then seasoned it with salt and pepper. I sprayed a jumbo muffin tin with cooking spray and press a ham slice in each of the muffin cups. I steamed some spinach and placed that at the bottom of the ham cup. I poured the egg mixture into the ham cups and then added cubes of mozzarella and halved cherry tomatoes to the egg mixture. I baked them at 375 degrees F, until the egg was completely cooked, about 17-20 minutes. Quarter and core the pears (do not peel them). Cut the rhubarb into 1-inch pieces. In a large bowl, combine orange juice and remaining 6 ingredients. Add the pears and rhubarb, and toss to coat. Pour into a casserole or gratin dish and bake until tender, 35 to 40 minutes. I feel kinda bad about not making this weeks TWD recipe, because it was chosen by one of my favorite bloggers ever- Cathy, who blogs over at The Tortefeasor. (You can find the recipe over on her blog- My apologies to you Cathy!). Even if you aren't interested in the recipe you should go read her blog. She is funny and entertaining and I love her blog. I have a couple of projects going on with my kids that involve cooking/baking this summer and I just couldn't fit the TWD baking into our schedule. Plus, I am trying not to bake more than once or twice a week (unless it is for someone else) just for the basic health of our family. I made these cookies last month when we went to pick strawberries and hadn't posted the recipe yet, so I decided they would be an okay substitute since they are shortcake, in a way. I had so many fresh strawberries that I didn't know what to do with all of them. 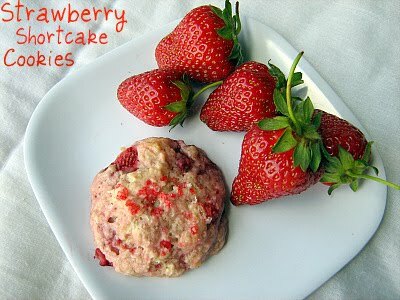 I found this recipe and it looked like an interesting twist on shortcake. The cookies are made like a biscuit or scone, with the butter being cut into the dry ingredients and then the cream being added to bring it all together. I used a little bit more chopped strawberries than called for and it made a really wet dough. The cookies still worked though, they just aren't as pretty as Martha's. oh well. * I used half & half instead of cream, since I had that on hand. The other day I made Lentil Minestrone (recipe to come), even though some people in my family don't really care for soup and definitely don't want to eat soup in the summer. 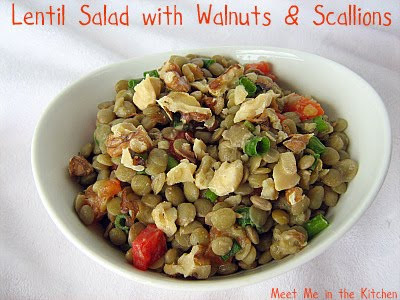 I made a comment about it on twitter and Nancy sent me the link for this delicious lentil salad as another way to enjoy lentils that doesn't involve soup. As soon as I looked at the ingredients I knew that I would love it and quickly put it on the menu for the next week. I absolutely love lentils. You might think I say I love everything, but there are a few things I don't love. Lentils are definitely a top 5 food for me though. When I was mixing up the dressing I realized that I was almost out of olive oil, so I only used about 2 Tbls. It still worked out great. I loved this salad warm and cold. I enjoyed the leftovers over salad greens. Going to the Farmer's Market on Saturday mornings is one of my favorite things to do in the summer. I love all the local produce. It makes me feel great when I support local growers and also makes me happy to know that the swiss chard, or whatever else I buy is grown naturally without pesticides. I also love taking my kids with me so they can see how important it is to me to buy local whenever possible. Plus, they love having input on what we purchase. One of my favorite things to buy is swiss chard. I just love it right now. This is one of the ways we enjoyed it recently. 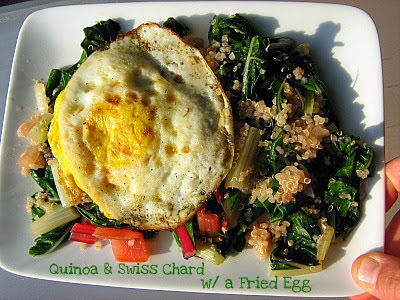 I sauteed the chard like I usually do, then added some cooked quinoa that I had in the fridge. I topped it all off with a fried egg (courtesy of my neighbor across the street). Perfect dinner, in my opinion. I planted basil a couple of months ago and it has really been producing and growing quite a bit. I love growing my own herbs because it saves me so much money and because it is fun to just walk out the door and snip what I need for dinner. My hubby doesn't really care for pesto and he can't stand tomatoes, so I waited until we had a family dinner at his mom's house to make this recipe. I knew there would be enough other people who like both of those things to help get this eaten. Making pesto is so easy. I reduced the oil in the recipe by quite a bit (I only used 1/4 cup) because I like my pesto less oily and a little bit thicker. 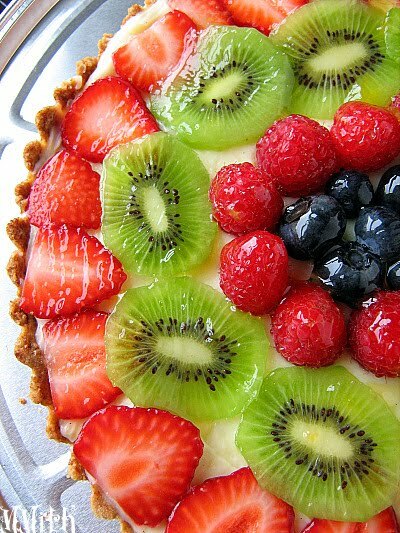 This turned out to be a really simple, delicious tart. Great for a group/party. 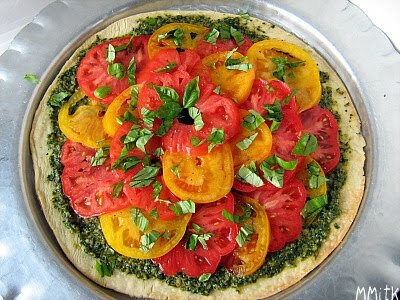 And perfect for summertime when basil and tomatoes are at their peak. A couple of weeks ago when we were grocery shopping, my daughter wanted to try the "rainbow" fish. She said that because the package that contained the mahi-mahi had a pretty, colorful picture on it. It was on sale, so I decided we could try it. 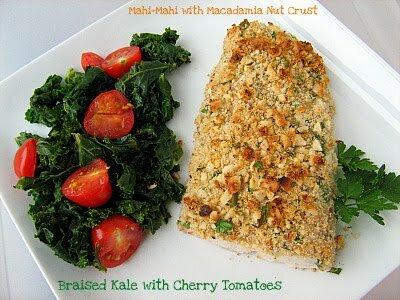 I love nut-crusted fish andI had already marked this recipe to try in my Mayo Clinic Cookbook. I decided to pair it with the kale because that is what the cookbook suggested. The fish was delicious and really easy to prepare. My whole family really loved it. The cooking method for the kale was nothing new to me since I cook dark greens this way all the time. I removed some of the kale from the pan before I added the tomatoes though, since my husband doesn't like tomatoes at all. Another great healthy dinner. I love the Mayo Clinic cookbook and the great thing is that you can find most of the recipes online at mayoclinic.com.